Since its first on-screen release, opinion on Venom has been much divided. One thing which people seemed to agree upon, however, was that Tom Hardy was the right actor to play the role of Eddie Brock, one half of the symbiosis. Very good he is, too; Hardy is a hard-working, hands-on actor. With such a rich and entertaining tapestry from the comic books (Venom was co-created by Todd McFarlane, who created Spawn, and whose company produced many exquisite and very highly-detailed collectables under the banner Movie Maniacs) it would be difficult to satisfy the many fans. The most common complaint seems to be that Venom isn’t sporting the big white spider design on his chest. Indeed, I can sympathise with this view. I grew up (have I grown up?) reading the Spider-Man comic books, and anyone who knows the timeline will argue Venom’s origin story lies with the webhead. The black costume saga ran for around seven years. Venom bonded with Spider-Man but influenced him to the point they fought a long battle for control. When the web-slinger succeeded in separating their bond, Venom bonded with Brock, an enemy of Peter Parker. The director here wanted to give Venom his own origin story and it sort of works, although I would have preferred he pay tribute to the comic stories, as James Cameron intended to do before the rights were untangled. The most well-known things known about the symbiotic creature is its relentlessness and dark humour. There are several instances of this, including the scenes in Mrs Chen’s store and the cameo of demigod Stan Lee walking a little dog. There is also a nice scene involving the homeless woman Maria, who is selling free newspapers. As you would expect in a Marvel film there are plenty of stunts and CGI-driven segments. The chase through the centre of town at night is particularly exciting, but doesn’t take over the film. Somehow, the movie manages to tell a character story held together by humour and loads of ridiculous situations. There is even a tantalising teaser scene with Woody Harrelson playing Cletus Kasady, who later becomes Carnage. Not the greatest shell in Marvel’s canon, but an enjoyable romp all the same. 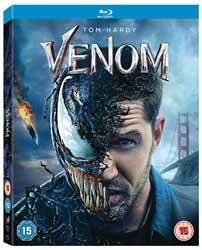 Extras include: The Venom video by Eminem (not great), a sneak peek of the animated film Spider-Man – Into the Spider Verse; Venom Mode (hidden references to the comic books throughout the film); The Anti-Hero (the backstory of the Venom character); Deleted & Extended Scenes; The Lethal Protector in Action (film stunts); Venom Vision (how Ruben Fleischer came to the project); Designing Venom (the effects); Symbiote Secrets (references made throughout the film); and 8 Select Scenes Pre-Vis Sequences (comparisons before and after effects).